A firm that developed a quarry on lands in County Laois on the basis of an exclusive licence with the landowner has been granted permanent injunctions restraining the owner from interfering with their business. The quarry firm and the landowner entered into the licensing agreement and planning permission was granted to the firm in 2009. However, the relationship between the parties broke down in 2011 and the landowner caused damage to the business by, inter alia, blocking access to the site. Granting the permanent injunctions sought by the firm, Mr Justice David Keane did not accept that there was any innocent explanation for the landowner’s interference and that he was clearly in breach of the agreement between the parties. Nutgrove expended a significant sum of money in applying for planning permission for the development of a quarry there – however, it was only when planning permission was opposed by Mr Sherlock’s brother that Nutgrove became aware that “the old quarry lands” still formed part of the un-administered estate of Mr Sherlock’s deceased father, who had died intestate in 1972. In January 2007, Nutgrove withdrew the application for planning permission, having incurred significant losses approximated at €135,000. In November 2007, Nutgrove entered into a further agreement with Mr Sherlock, whereby it obtained the exclusive right to quarry limestone rock on adjoining lands described as “the lower field”, directly owned by Mr Sherlock. Make aggregate payments to Mr Sherlock in accordance with the agreement in the first week of every month. Planning permission was granted in 2009, and the Court heard that Nutgrove spent over €150,000 in developing the quarry. The Court heard that the “lower field” quarry agreement operated without apparent incident throughout 2009, 2010 and much of 2011, and that despite the economic crash, Nutgrove did reasonable business and made payments to Mr Sherlock amounting to €169,000 during that period. Deliberately blocking access to the quarry by placing a tractor and slurry tank across the entrance to it, preventing access. Nutgrove also sought the attachment and committal to prison of Mr Sherlock for deliberate breach of an interlocutory order made by Mr Justice Paul Gilligan in July 2015. Mr Sherlock denied that claim and counterclaimed for breach of agreement against Sean Wisely and John Wisely – directors of Nutgrove. On the balance of probabilities, Mr Justice Keane found that: at all material times Mr Sherlock represented himself as the owner of the old quarry lands; that there were licence agreements between Nutgrove and Mr Sherlock, and that the licence to quarry was an exclusive one; that the agreed payment was €20 per lorry load, not €1 per tonne as Mr Sherlock had argued, and that there was no rent payment agreed. Mr Justice Keane also found that Mr Sherlock broke into Nutgrove’s site office; that he sold limestone rock and other material from the lower field quarry in breach of the lower field quarry agreement; and that his refusal to permit Nutgrove access to the site in November 2016 was in breach of the agreement and the interlocutory order made in June 2012 restraining him from locking Nutgrove out of those lands. Granting Nutgrove the permanent injunctions, Mr Justice Keane was satisfied that Mr Sherlock had breached the agreement by interfering with Nutgrove’s quarrying activities. 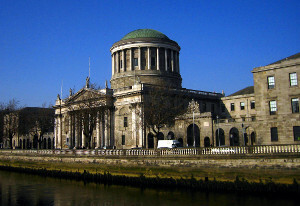 Mr Justice Keane was, however, satisfied that Nutgrove’s application for the attachment and committal of Mr Sherlock for his alleged contempt of the order made by Mr Justice Gilligan was “legally misconceived”. Refusing to grant an award of damages to Nutgrove, Mr Justice Keane said that he did not believe there was the necessary evidence of loss or damage before the court to permit such an award – “subject to whatever submissions the parties may wish to make on that issue”. Mr Justice Keane did not accept the evidence proffered on behalf of Mr Sherlock, and his counterclaim was dismissed “in its entirety”. Dismissing Mr Sherlock’s submissions that he had been underpaid, Mr Justice Keane also rejected the submission that Nutgrove’s compliance with planning law was not an implied term of the agreement – and that if Mr Sherlock had concerns, the appropriate way for him to address them was by dialogue or complaint to the appropriate authority, not physical interference or “scurrilous abuse of Nutgrove’s directors and staff”.